Well, you know how on the last post I mentioned a few ideas I’d had for dates through the year with my boyfriend, and top of the list was a night out at a Comedy Club. I thought this was a pretty cool idea and really unique, until last night. You know that moment when your heart sinks, or at least thinks, CRAP thank God I never booked it, well last night was one of those moments. There we were sat watching Live at the Apollo, laughing away, me thinking smugly that this would be a great date night when the boyfriend says ‘I’ve never fancied seeing anything like this live, it’d just be boring’. Yup. There it was. So my amazing and unique idea just got flushed down the drain like one of those spiders that doesn’t pay rent therefore has no right to be in your house let alone the bottom of your bath. Boooo. Here’s the link, now how amazing does that look and sound? I think I’ll make it April time when I get the kitchen to myself at home because mum’s away, it can be a surprise for him haha. Now I’m off to feed my addiction, AGAIN, for the rest of the night on Pinterest and plan dessert! One date night out of 12 is a start right?? So, as a huge The Hills fan (pre LC departure, obvs) I follow LC on Twitter and her blog is pretty awesome, especially when it comes to gift ideas, even if you don’t go with exactly what she says because of country restrictions for example, its still inspiring. One of her latest Valentine blogs contained a really unique idea that she had read about herself, via a blog…… http://www.laurenconrad.com/post/tuesday-ten-valentines-day-gift-ideas and number 5 really caught my attention. SO, I’m currently trying to figure out whether this is a good idea for me, the whole 12 set dates thing, or rather my boyfriend, I think it’s quite unique. I may buy him some special cheesecake too and slap a ribbon around it, to show effort haha really though, he does love his cheesecake, it’s like a whole new revelation for him! I’m pondering over ideas at the moment and have made a shortlist…. And then there’s a few local days out. The thing is, we always say lets go out more but, we either hit the same old restaurants which I do love but, you do get a bit bored of the same old thing, or we end up sitting in watching tele because we’re both a bit skint! Now with the frosting, it’s all about taste, if you want more cocoa powder in then just adapt to how you’d like it. Prepare your 3 cake tins. Line the base with greaseproof paper. 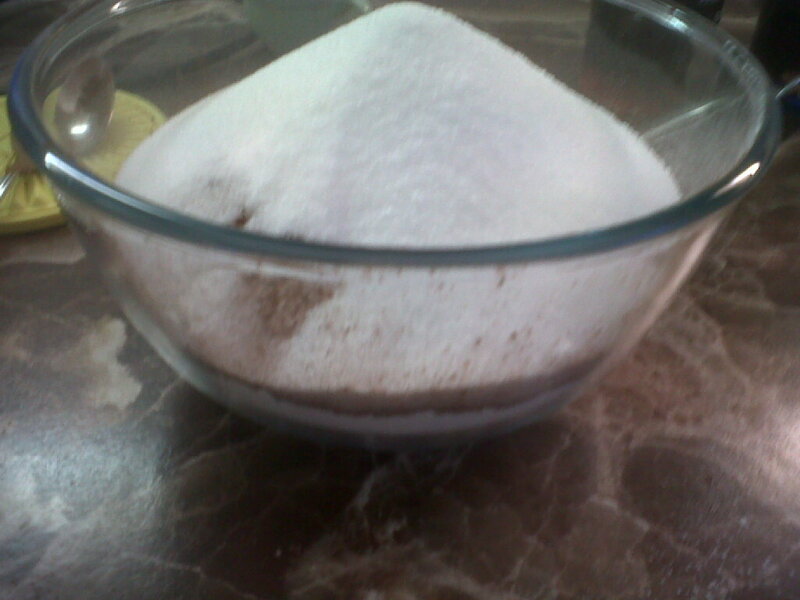 Into a large bowl, sift your flour, sugar, cocoa powder, baking powder and bicarbonate of soda. Into a large jug, pour your milk and cider vinegar and leave to sit for 5 mins. Stir the milk mix as it will look curdled by now, it’s supposed to resemble buttermilk. Of course I guess you could buy buttermilk if you so wished. Add in the oil, Camp/coffee and vanilla extract and mix very well again. 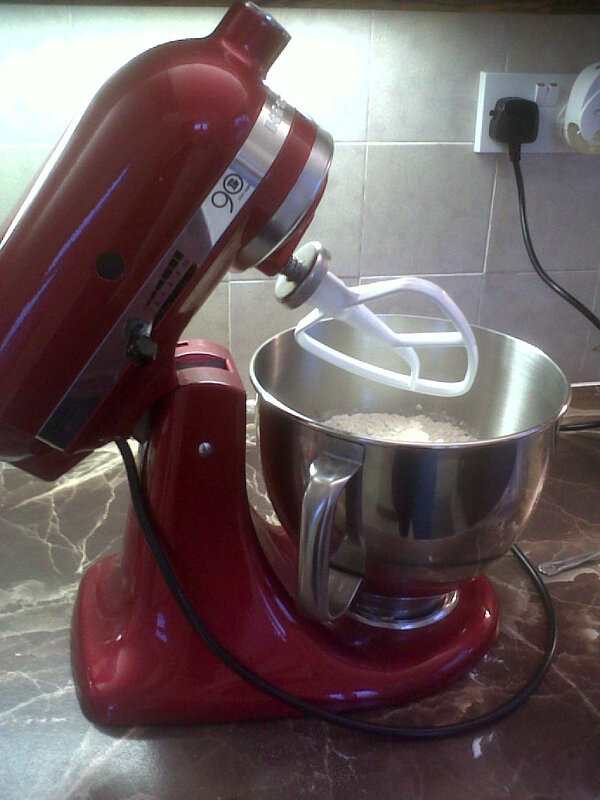 Pour your flour mix into the food mixer, begin to slowly beat and gradually pour in the milk mix. 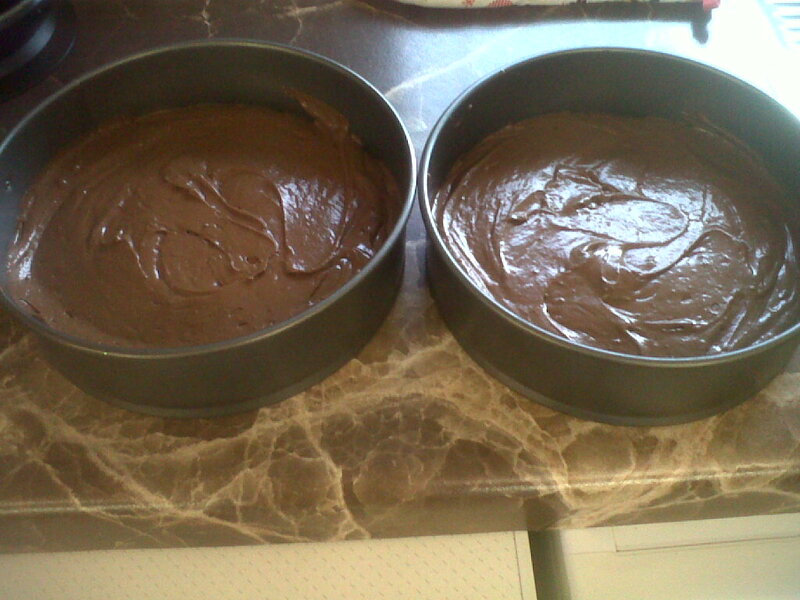 Evenly distribute the batter between 2 cake tins and pop in the oven for 30 mins. Wash up and get ready to start on the middle layer, the vanilla cake layer. In your food mixer, beat together the butter and sugar until pale and creamy. Sift together your flour, baking powder and bicarbonate of soda (baking soda) in a separate bowl. In a jug, pour your milk, add the cider vinegar, leave for 5 minutes then stir. Add your vanilla extract to the butter mix. Beat briefly until the vanilla is well mixed in. Alternately, beginning with the flour mix, pour in your flour and milk mixes to the butter, eg, 1/3 of your flour mix, 1/2 of your milk, 1/3 flour mix, 1/2 milk, 1/3 flour mix. Be careful not to overbeat. Pour the whole mix into one cake tin and place in the oven for 25/30 minutes. Place your butter in the food mixer and beat until creamy. Add half of your cocoa powder and beat. Add your icing sugar gradually, if the mix gets thick, add your milk. Add the rest of your cocoa powder until you have a fudgey frosting. 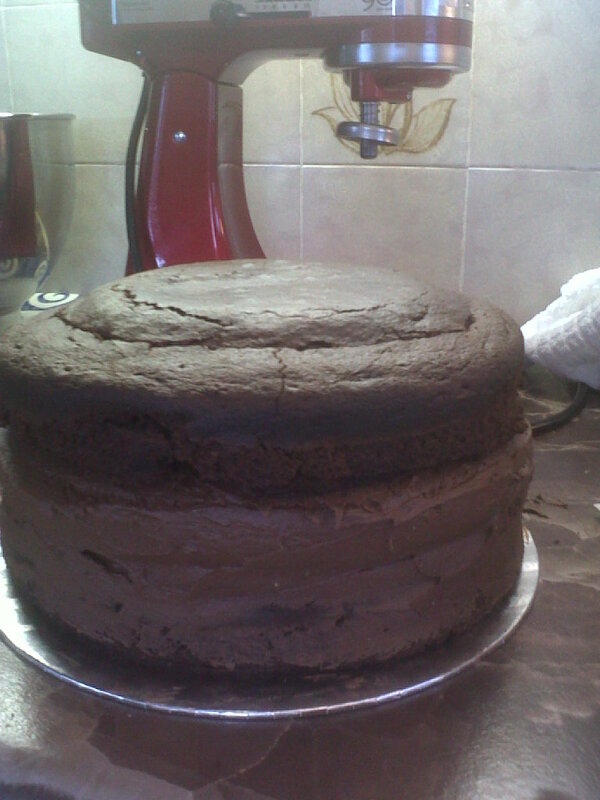 It may look a lot but remember, you have a 3 layer cake to cover and fill. Once your cakes have cooled, begin to assemble them onto a cake board. 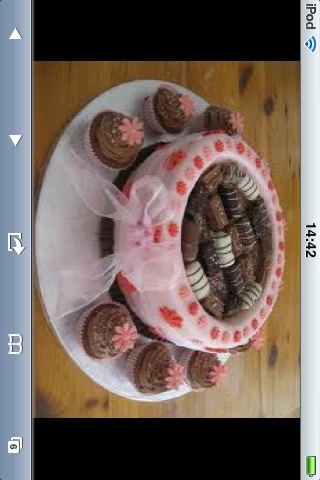 I misplaced my icing turntable, utter nightmare, the cake gets very heavy! Frost inbetween each layer, carefully assembling. Any excess, just spread it down the sides. Now, very very carefully, taking a sharp knife, cut out a ring on top of the cake. Luckily, on this occasion, I had a hump on top of my cake so cut that out. I had a couple of cracks, as you can see just at the front, but you can cover this with your frosting if you’re careful with how you handle the cake. 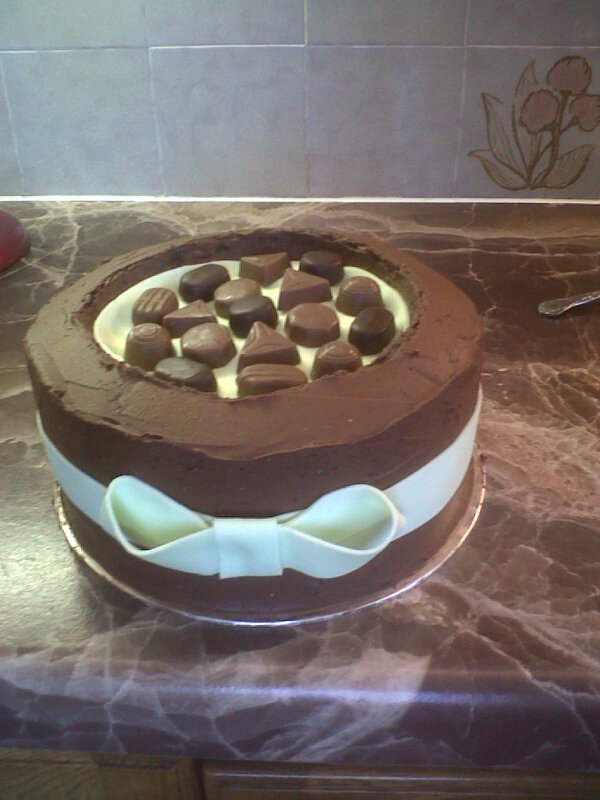 Once you have covered the whole cake, I would advise using some fondant to line the inside where the chocolate will sit. Spreading frosting inside that dip is no easy task, crumbs will come away and stick to your spoon/spatula but don’t fret. 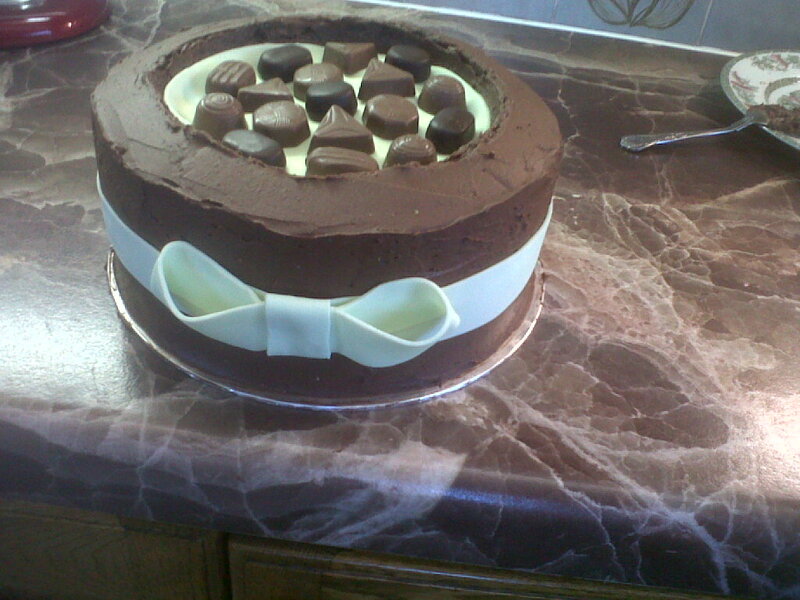 Fondant was my saviour on this day and covered up the mess in the middle, nobody had a clue….until now! I hope I’ve explained everything clearly in this post, if not please just ask if you have any questions!! 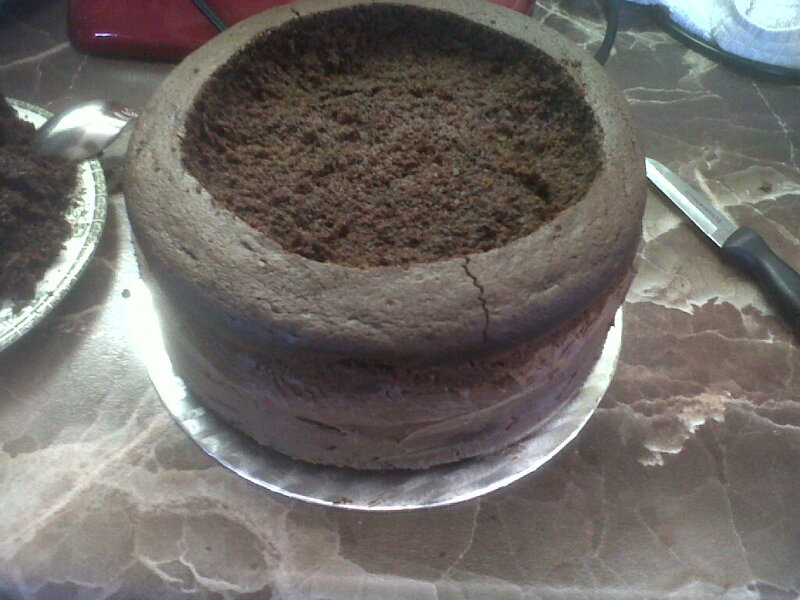 This cake feeds soooo many people but lasts about a week if you keep it in an airtight container. Anyway, I feel a little like a feeble now after my Chicken Liver Pate on Melba toast, Roast Beef and lotsa veggies and a lush Apple Crumble! I am slowly drifting into a food coma, I am so beyond stuffed yet……I wonder what’s for tea? I’m off to slip back into my comfies now before the Simpsons and X Factor!